Let the Mandalorian bounty hunter keep your tie straight! Features a painted Boba Fett helmet in the middle of the tie bar. Flaunt your Star Wars fandom! Class up your work attire with the help of Star Wars and this excellent Star Wars Boba Fett Helmet Tie Bar! If Boba Fett were to attend a suit and tie event he'd surely wear this to keep his tie straight, and if they're good enough for Darth Vader's go-to bounty hunter, then they're good enough for you. 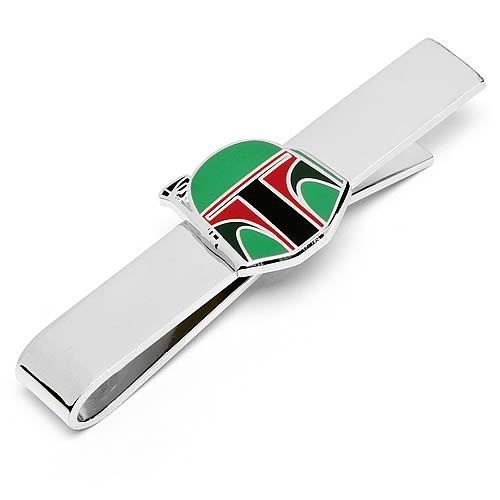 Flaunt your fandom functionally with this Star Wars Boba Fett Helmet Tie Bar! The tie bar measures about 2-inches wide.